Did you know that many of our interns end up getting placed in our Graduate Leadership Program? Introducing Meet Davé, a former intern who has joined us full-time at Bell. 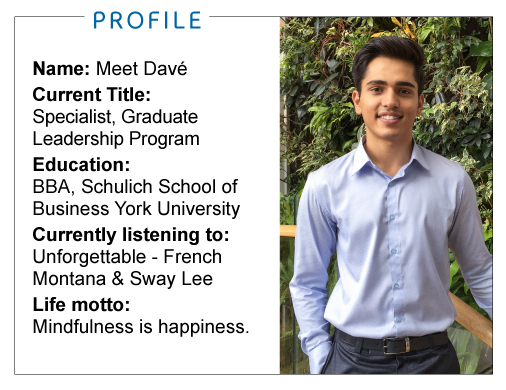 Meet Davé: I recently graduated with a Bachelor of Business Administration (BBA) from York University at the Schulich School of Business. During my time at York, I had the amazing opportunity to form the university’s first ever Business Sales Club. In just 3 years, we were able to transform an idea that existed only on paper into a Schulich-sanctioned club. Traveling has become my biggest hobby – I’m always looking forward to the next adventure. This past year I had the chance to travel to 15+ cities across India, Europe and Western Canada, where I discovered my love for backpacking and connecting with the stories of incredible people from across the world. Bell: Tell us about what you do and your role at Bell. MD: I am currently 2 weeks into the Graduate Leadership Program (GLP) in the Consumer Markets and Media Stream. The program allows new grads like myself to gain a holistic understanding of Bell’s strategy and operations by rotating through multiple teams and areas of the business. For the next 3 weeks in my role, I’m focused on improving the retail merchandise shopping experience by watching customer interactions and providing recommendations for product assortment, pricing strategies, and store layout. After presenting my analysis and recommendations to the leadership team, I will move on to a new business rotation in October. MD: One of the best things about the GLP program is the number of incredible people you get to meet and build relationships with. Every morning I’m excited to get to the office because I work with great colleagues, friends and mentors that bring out the best in me. I also love that the industry is evolving daily. Whether it’s the changing face of TV or the rise of Internet of Things (IoT) technologies like connected cars and smart cities, this program gives me the opportunity to drive innovative business projects with incredible people. MD: There is no real “average” day at Bell – especially during the first month of joining as a new grad! Every day I wake up at around 7 am, make myself a strong cup of coffee, and either head over to our retail stores or the office to meet with my team and discuss project findings and build recommendations. Since I’m starting my first 7-month business rotation in mid-October, I also spend a lot of my time on calls or coffee chats with managers across the business, learning about their teams and projects to help me decide what positions would be a good fit for me. Bell: What made you decide to do you internship at Bell? MD: I met Patricia Melville, Senior Manager, Leadership Development, at a consulting conference in Toronto, and she told me about the internship. While I didn’t know too much about Bell or their internship opportunities, the structure of the program and the opportunity to return full-time as a member of the best grad program in the country drove me to apply. During the 3-month internship, you have the opportunity to learn about multiple areas of the business, analyze big data, work with incredible colleagues, and present your findings to executives. For me, this opportunity allowed me to develop skills and have an impact that I couldn’t have elsewhere. MD: My advice to students would be to target opportunities that will maximize your skill development, enable you to make a tangible impact and get real work experience. Internships should serve as an opportunity to learn and build a skillset that you can’t develop sitting in a lecture room. Also, as cliché as it may sound: network. This doesn’t mean that you should go and get 500+ connections on LinkedIn, but do make an effort to attend networking sessions, meet with individuals who are currently in roles that you would be interested in, and create meaningful relationships – it goes a long way. Interested in joining one of Bell’s internship programs? Visit our career site today to learn more.